One-on-one attention is a rarity these days. Luckily, at SummerMaine, it is the foundation of our business. So don't expect to get a receptionist or have to press "1" for rentals. When you contact me, you are contacting a company that truly wants to make your vacation as perfect as possible. As crazy as it sounds, I am as excited about your vacation to Maine as you are! SummerMaine is essentially a matchmaking service — a matchmaker pairing vacationers with the perfect house to make their vacation just right. If one house isn't the right fit for your needs, I will help you find another that is. After you find the house, look to SummerMaine to be a guide to the area. Want to eat a lobster dinner on a dock or take in a world-class concert? How about a ride on a lobster boat or a day at the spa or the perfect place to have a picnic? Just ask...I'll point you in the right direction. The reason SummerMaine is so good at this? I love Maine — after all, I was born and raised here and ultimately made to decision to return after 10 years of living "away." Being brought up in the small community of Tenants Harbor gave me a unique view of the world which has been enhanced by the opportunity to explore places outside of Maine's borders. I enjoyed everywhere I went but, after all, there is no place like Maine! I know why people want to come here, to vacation here and to be part of our unique way of life — whether it is for one week or the entire summer. The Midcoast area is such a special place. The feeling you get here is about more than being on vacation. It is about an experience and an escape for family and friends. I believe in the absolute joy of spending time in Maine and that's why I love this business. I love sharing a place I cherish with people who may have never experienced its pure simplicity and welcome back those who have already fallen in love with it. 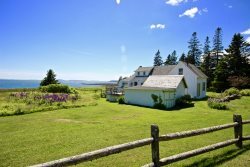 SummerMaine is Maine and SummerMaine is where your perfect vacation starts. We look forward to making you vacation a memorable one!